The Tahoe Truckee area has many reasons why it’s an adventure paradise, and rock climbing is right up there with the best of them. 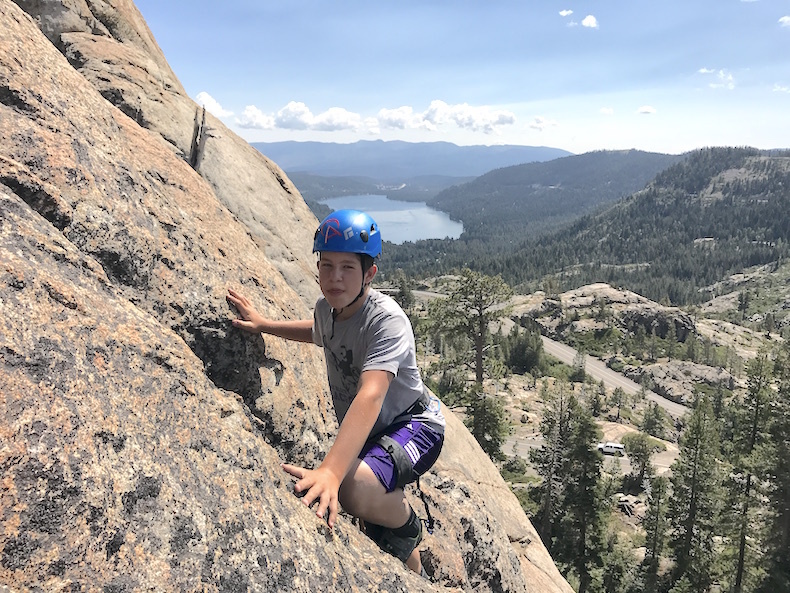 From beautiful views of Donner Lake, to easily accessible cliffs for all ability levels, Donner Summit is a rock climbing paradise nestled right above Truckee, California. 1. Easy Access – The cliffs and crags of Donner Summit are some of the most easily accessed in the nation. Drive right up Old Highway 40 (Donner Pass Rd) and you pass no less than 5 different crags, all easily visible from the road. Some approaches are literally right outside your car door, while others are a calf-burning 10 minutes. Jokes aside, Donner Summit rock climbing is easily accessed with most crags a stone’s throw from the parking lot. 2. 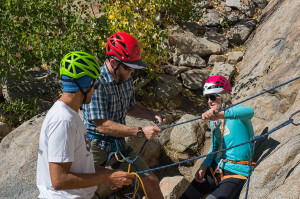 Rock climbs for All Abilities – Donner Summit rock climbing literally has something for every type of climber. Are you a first-time rock climber looking to explore what the sport has to offer? The aptly named “School Rock” has climbs ranging from mere scrambles that everyone can enjoy to more vertical rock climbs that will challenge a climber with a little experience looking to improve their skills on a multi-pitch (more than one rope length) rock climb. For the seasoned rock climber looking to push their limits, “Snowshed” and “Star Wall” have rock climbs that rival the toughest in the country. Snowshed features a couple bolted 5.13 rock climbs while Snowshed is for experts only. The easiest climb on Star Wall is 5.12 with the hardest topping out in the 5.14 range. 3. Incredible Views – from nearly every crag, rock climbers have an incredible view of Truckee and Donner Lake. It’s hard to have a bad day when you are hanging out with friends overlooking a beautiful lake surrounded by tree covered mountains. 4. The Rock – Donner Summit is comprised of granite rock, and this medium is some of the best to climb on in the world. Think about the legendary cliffs of Yosemite Valley, and you have the right type of rock in mind. Rock climbing on granite can be challenging, but the cracks that split the otherwise impenetrable cliffs provide many options for climbers of all abilities. Learning how to place natural gear is a rewarding experience in itself and prepares rock climbers for bigger rock climbs in Yosemite and the High Sierra. Become a good granite rock climber, and you can go anywhere in the world and be a confident ascensionist. 5. World Class Guide Service – Ok, shameless plug here… but it’s true. Alpenglow Expeditions is a world class mountain guide service that employs the most experienced and friendly guides in the business. Looking to get the youngsters into the sport? Check out our family half day of rock climbing. Want to explore some of the more complex climbs? Perhaps a private day of rock guiding is up your alley. Looking to improve your skills in case of an emergency? Our Self Rescue for Rock Climbers is a comprehensive day-long course that will give you the skills and techniques needed to get yourself out of a sticky situation.